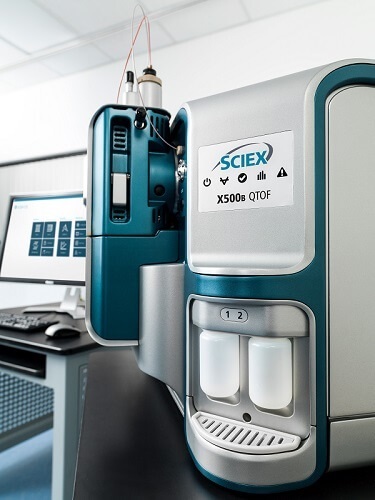 FRAMINGHAM, MA — SCIEX , a global leader in life science analytical technologies, today announced their latest solution in the X-Series Quadrupole Time of Flight (QTOF) mass spectrometry (MS) platform. The newest X-Series model, the X500B QTOF System, brings simplicity, high-performance, and robustness for biotherapeutic analyses to one of the most compact MS system footprints on the market. The new user-friendly SCIEX OS Software interface and powerful BioPharmaView™ 2.0 processing software comprise an unmatched integrated LC-MS solution for mass spec experts, or novices, performing standard biotherapeutic characterization. The X500R QTOF System emerged in 2015 as the first LC-MS solution designed specifically for routine food, environmental and forensic testing, and introduced an entirely new industrial design, fully-loaded with easy to use software, methods and libraries, custom-designed for targeted customer applications. The X500R QTOF has since won awards and achieved accolades by industry leading laboratories and key opinion leaders. Like the X500R, the X500B QTOF System was specifically developed to deliver ease-of-use for high resolution standardized workflows, for biotherapeutic developers, who are required to fully characterize biologic products in large numbers during the development process. Many MS-based workflows require users to be mass spectrometry system experts and they must perform complicated data processing and manual calculations. The workflows can be complex to setup and involve intensive and sometimes confusing software. The X500B QTOF offers the robust and streamlined, quality instrumentation SCIEX is known for, with the intuitive SCIEX OS user interface for simplified workflow setup. To simplify complex data processing the X500B QTOF System comes with BioPharmaView Software 2.0, enabling scientists to generate better information, faster. BioPharmaView Mass Spec Software also offers the ability to interpret SWATH® 2.0 data independent acquisition on the X500B QTOF System. SWATH® acquisition allows for comprehensive peptide mapping data to be acquired in a single injection, with high-resolution MS and MSMS data for every peptide in the sample. This strategy results in the ability to detect important low abundance peptides and post-translational modifications that may be missed with other approaches. With the X500B QTOF System, all users can achieve expert level results in their biotherapeutic characterization workflows. © 2017 AB Sciex. The trademarks mentioned herein are the property of the AB Sciex Pte. Ltd. or their respective owners.